This classic Antique Rose on white duvet cover has a delicately pretty toile de jouy design depicting floral patterns, and a classic blue stripe on white reverse, bringing a fresh yet traditional feel to your bedrooms. Beautifully constructed exclusively for Out of Eden in Portugal from 180 thread count 50/50 polycotton, the duvet covers are made with wide shoulders and as few metal poppers as possible, to make changing faster and easier. The duvet covers come as separates, not sets. Housewife pillowcases are striped and Oxford pillowcases are floral. Duvet covers have metal poppers. 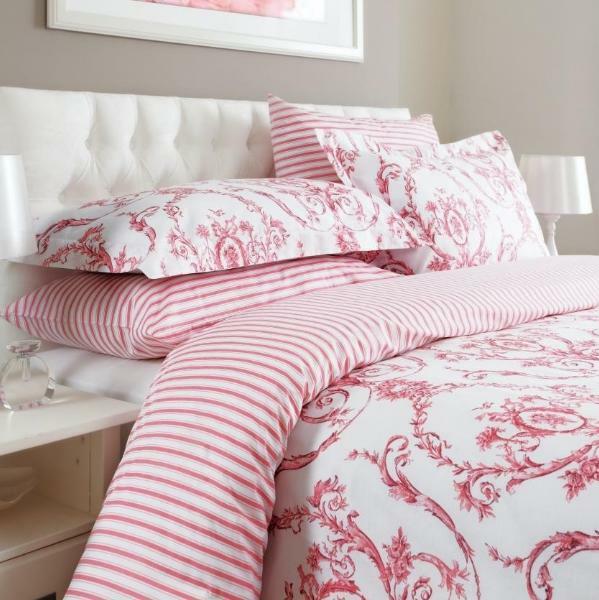 Housewife pillowcases are striped and Oxford pillowcases are floral patterned. Wash at 40c, cool tumble and medium iron. Great quality and looks even better on the bed as a set. Lovely quality and design. Will buy again. lovely quality and great value for money, and easy to iron! Excellent quality and value for money. Looks really elegant within the room. Absolutly delighted with my bed sets. The quality is fantastic. I do have most of my linen from Out of Eden, but this is the best.